Biafra: The Best Time For Biafran Revolution In Martin Luther’s Way! When King Martin Luther became convinced that the "just shall live by faith," he discarded all doubts and fear in him and confronted the Catholic authorities. He went headlong in convincing converts, hence the birth of the Protestant church. Protestant because he protested against many ills and evils going on in the church at that point in time. The church dogma was broken and divided by Martin Luther. Nigeria's kingdom, created by British colonialists as a safe domain for oil siphoning and racketeering has come to the fore and now is the time to take the bull by the horn. We never assented to one Nigeria in 1914, nor are we doing so now, hence we are right and ripe to demand for our long overdue freedom. 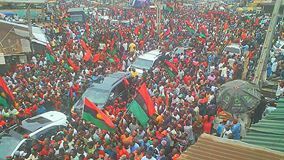 The time has come to demand for our Biafra. Many of our brethren were slain in cold blood but just like Luther resisted the Catholic Church, America resisted the British to gain freedom, we refuse to be slaves. The songs of freedom must continually be on the fore and must never leave our lips. Biafran musicians, writers, printers, etc, must convey the messages far and wide. Our only politics must be the demand for freedom. We must abandon the lying and subjugative political machinations which has long held us captive and left us in abject penury and pain. Nigeria, may exist peacefully, if she allows all of Biafra a peaceful exit. Our exodus is imminent. Pharaoh perished when he wouldn’t let the Israelites go, his chariots were not spared, nor his soldiers, Nigeria must be warned. The alliance between the British government and Nigeria can continue without Biafra. We must continue with civil disobedience as a very potent tool in this campaign of emancipation and which particularly must be a complete boycott of the fraudulent electoral processes. The emancipation of Biafra is a divine mandate and must summarily be achieved. Biafrans, it is time to take back our freedom. We must never relent, until the sun rises fully from the land once again.